Doctor Who fans are accustomed to certain rites of passage when it comes to the regeneration of the show’s central alien. First comes the announcement of the actor (this time with more fanfare than the Royal Wedding). Then there's his first onscreen appearance (which kind of already happened twice). And finally there's the reveal of his new costume, a box that Whovians can check off now that the BBC has released the below first image of Peter Capaldi in the 12th Doctor's costume, confirming he’s wearing, well, clothes. Specifically, the Scottish actor is wearing a navy Crombie coat, a cardigan, and some ill-fitting pants, which—coupled with a rather dramatic hand gesture—make him look like the sternest magician in the world. Speaking of the 12th Doctor’s look, Capaldi said, “He’s woven the future from the cloth of the past. Simple, stark, and back to basics. No frills, no scarf, no messing, just 100 percent Rebel Time Lord.” The term “Rebel Time Lord” is sure to cause a flurry of activity on Tumblr as fans speculate about the 12th Doctor's personality, as will the fact that this ensemble is fairly similar to the 11th Doctor’s later costume. Still, the red lining of the coat and the Doc Martens add a certain edgy flair, which seems fitting for an actor who once fronted a punk rock band and dropped acid with Craig Ferguson. 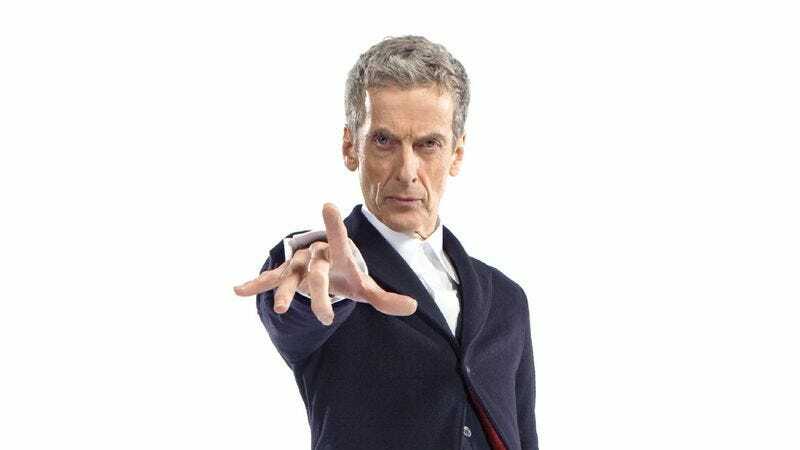 The show’s eighth season—the first for Capaldi—is filming now in Cardiff. There’s no official premiere date yet, but the show is expected to return in fall 2014. According to showrunner Steven Moffat, “Capaldi is suited and booted and coming to get you!” Basically, run.